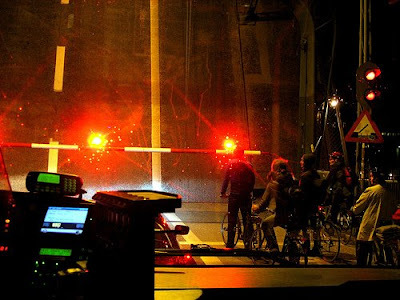 Cyclists waiting for the drawbridge on Langebro. Thanks to Mariana for the photo. You don't really get around bridges if you live in Copenhagen. The Copenhagen Harbour was de-commercialised a few years back, with shipping activity being moved to other locations. A thousand years of commerical shipping ends and all of a sudden 42 km of waterfront opens up. 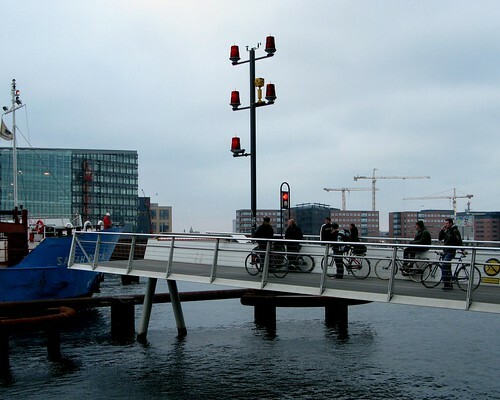 Copenhageners have gained access to the waterfront in places where they could never go before. And the harbour is now clean enough to swim in to boot. The main problem, however, is that the two main bridges over the harbour - both drawbridges - no longer go up as often as they used to. For the better part of a century the classic Copenhagen excuse for arriving late was "Sorry, but the bridge was up..."
The bridges still go up for the occasional ship but it happens in off-peak hours, not several times an hour as used to be the case. So THAT excuse is tossed out the window. We're still desperately searching for a collective alternative excuse. 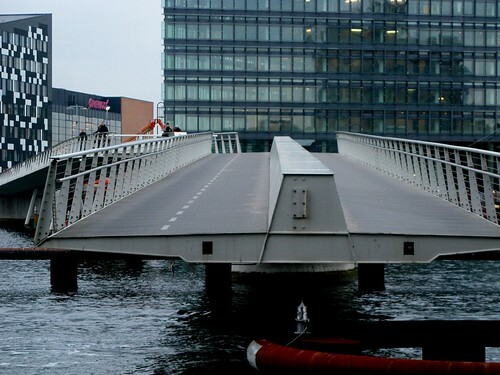 The new bicycle and pedestrian bridge over the harbour - Bryggebroen - doesn't actually go up, it swings. Cyclists wait patiently behind a little boom that swings out. Here is the flow of cyclists over Knippels Bridge, as captured by a tourist. The little bridge over Nyhavn in the heart of the city is also a drawbridge. 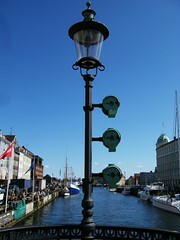 These are the traffic lights for the ships.